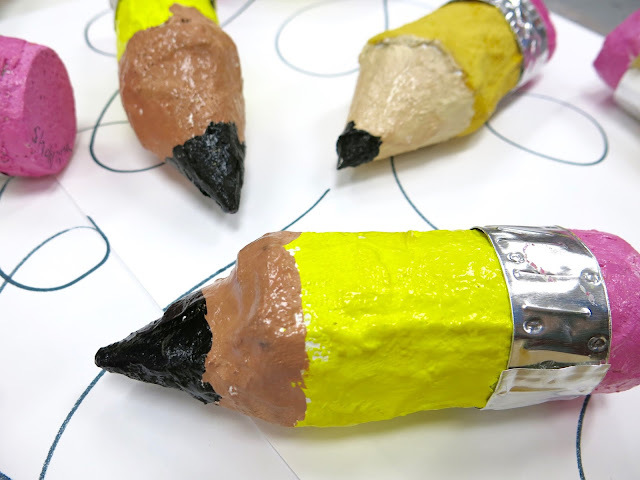 Second and third grade are creating these crayons. 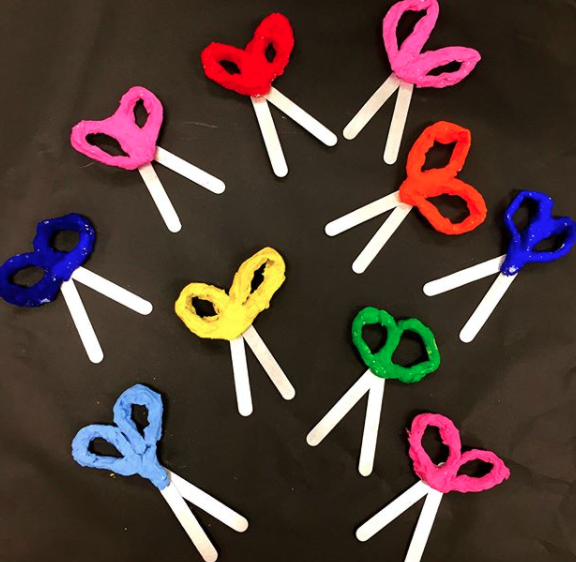 We did these a couple of years ago...but I'm doing the lesson a little differently this year. I'll be sharing the details in a blog post super soon. Second grade is also in charge of the collage department. 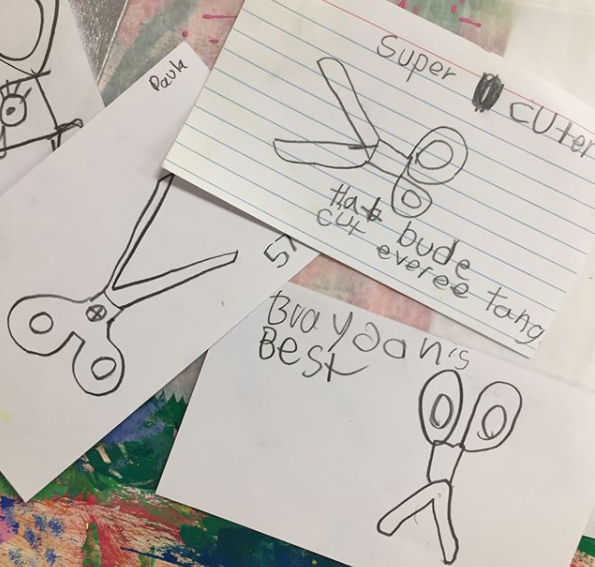 They created these glue sticks and scissors (below) and are now coming up with names for their glue and scissors. My second graders are the funniest kids ever, by the way. 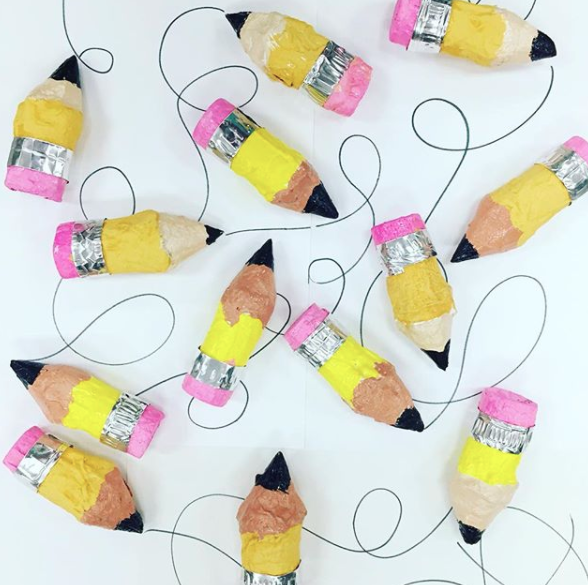 My fourth graders were creating these pencils and my first graders saw them and FLIPPED OUT. "When are we making THOOOOOOSE?!" So...I had the firsties make some too. And guess what? 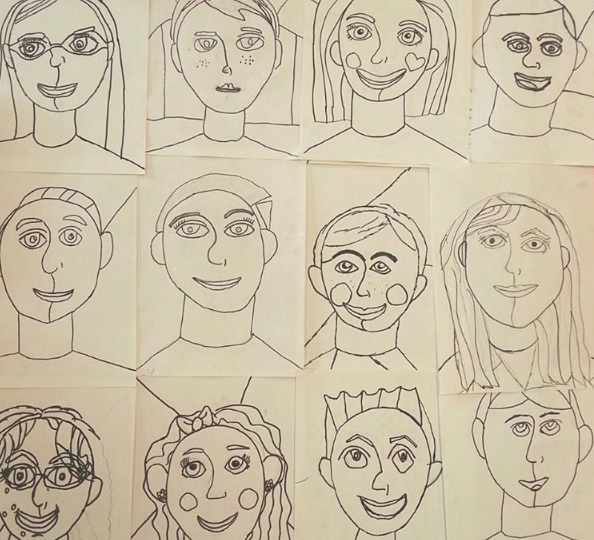 They look just as good as the fourth graders! They are so proud of them. Here's the lesson. But now....back to the glue bottles. * Packing pockets. 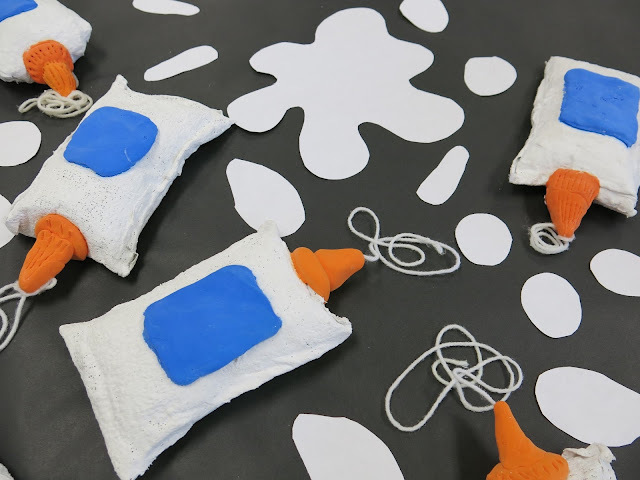 I'm not real sure what they are called...but if you send out a school-wide email, you'll get some. I now have a huge stash! * Rigid Wrap. Full disclosure: I work with Activa Products to create lessons. That being said, I LOVE their Rigid Wrap mostly because I am not a fan of papier mache. This stuff works so much better, dries super fast and doesn't require as many layers to create a hard surface. It's my jam. * Model Magic. Y'all know I'm not a huge fan of Crayola's Model Magic...but for this project, it worked perfectly! And you'll only need a pinch to get the job done. 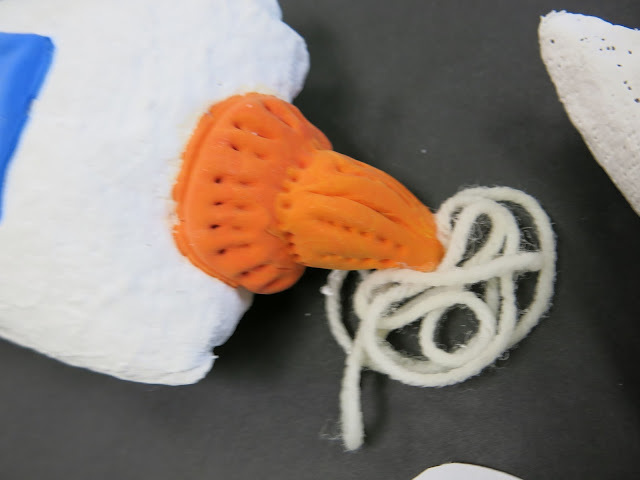 * White yarn. For the spilled glue. * Glue! Yep, you'll need glue to make the spilled glue. I know, sounds crazy. Just hang with me. Now, one tip I fail to mention in the video is this: the Model Magic, as it dries, does this drooping thing. Meaning that orange tip might start to slowly change it's shape. 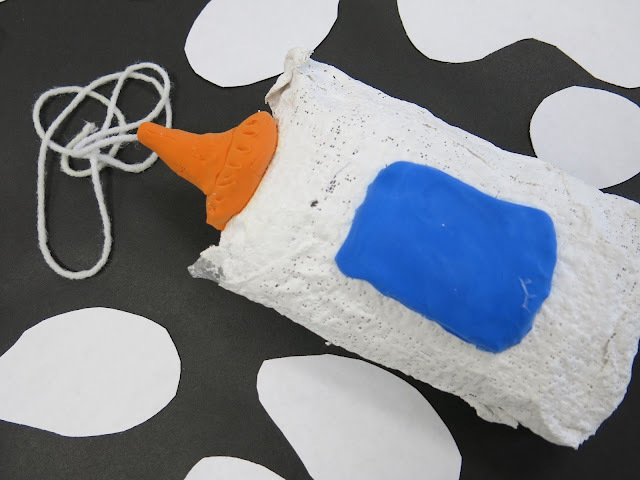 Knowing that, I had my kids grab a paper towel, squish it flat and place it underneath the tip of the glue bottle as it dried. The kids loved getting super messy. They even finished in enough time that they could have used clay to add coils of words but...maybe next time. I do want them to add a label. 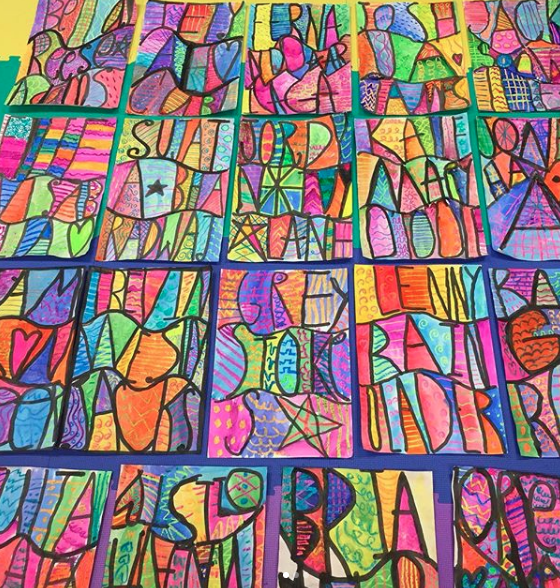 My second graders have had so much fun dreaming up the names of their art supplies I have a feeling that fourth grade will too. I'll be sure to keep y'all posted on the progress of our art supply sculptures. Until then, close those glue bottles and stop spilling glue all over the place, ya filthy animals! Oh my goodness, y'all! 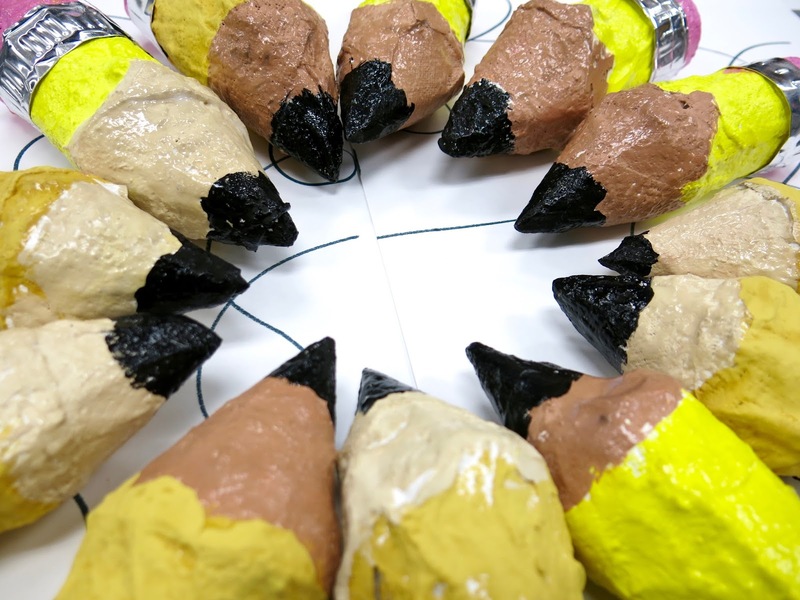 These wee pencils were just about the easiest two day sculpture project ever...and look how stinkin' cute they are! 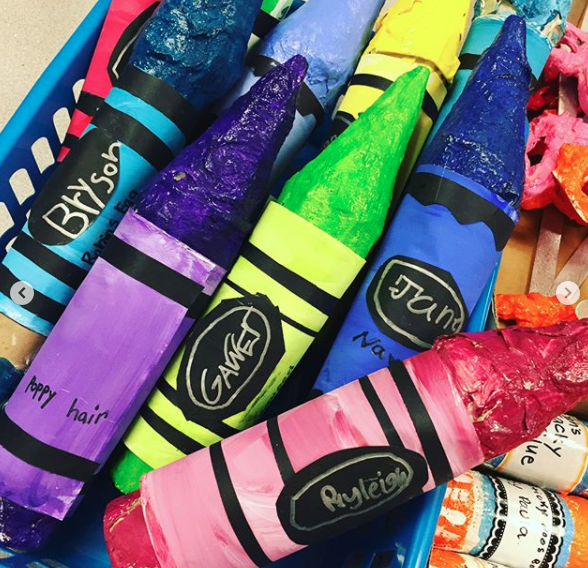 If you follow me on Instagram, then you know all of my kiddos are creating sculptures of art supplies. So far, we've made sculpture of crayons, scissors, glue sticks and big pink erasers. I'll be sure to share all of those with you, as well as how-to videos. 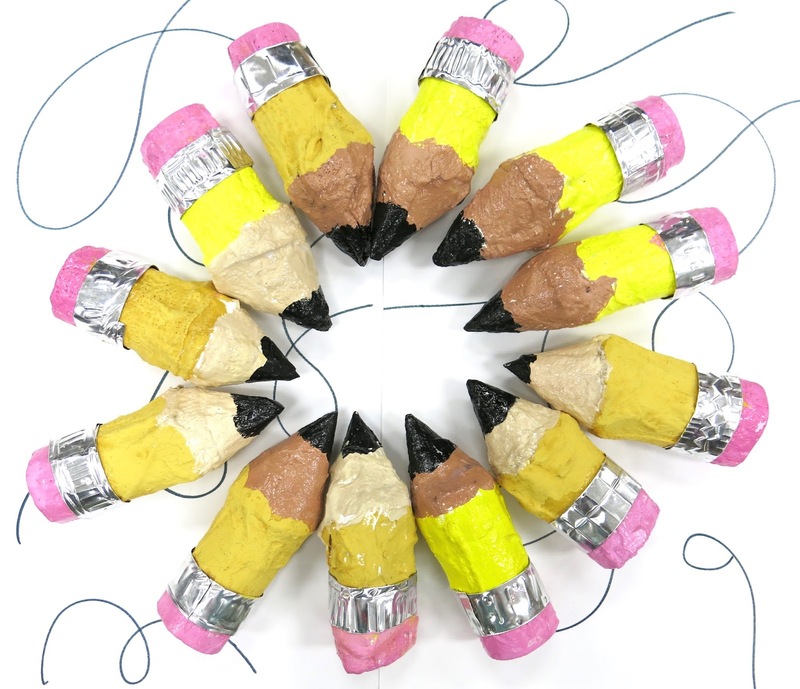 But today, I thought I'd share these super cute pencils that my fourth graders made in just 2 one-hour art classes! Here's a video I created to share the simple process! 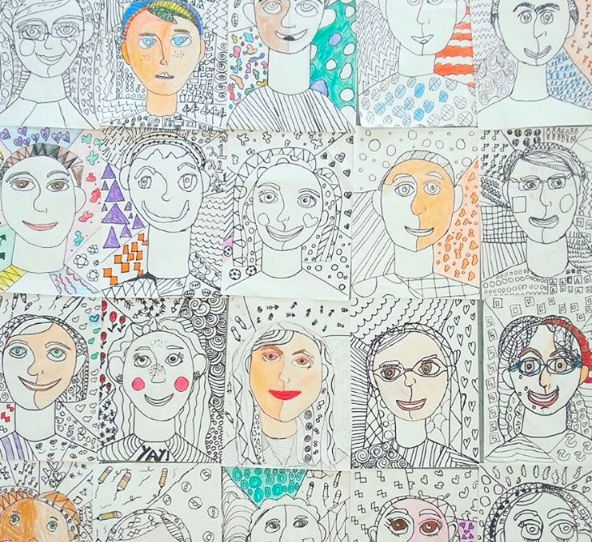 Day One: Our inspiration for this project is the artist Lucy Sparrow. 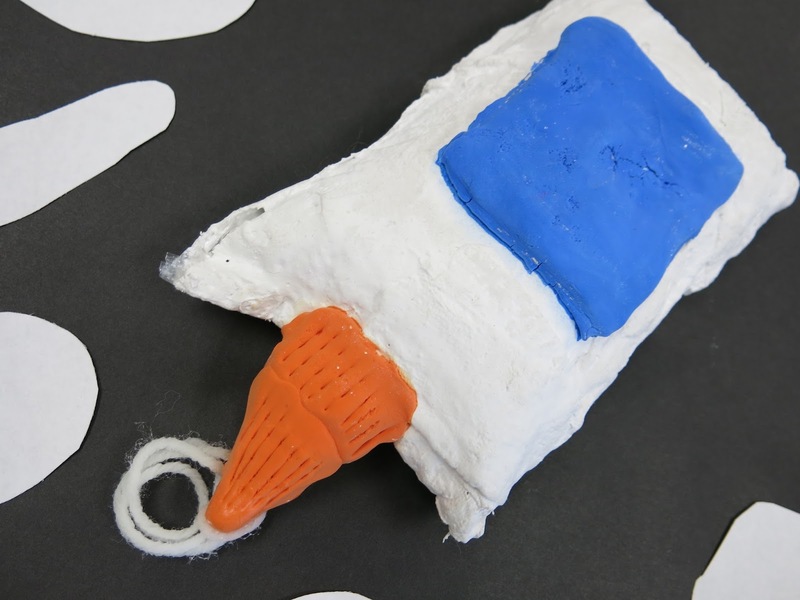 If you are not familiar with this British artist, she created an installation that looks just like a convenience store with everything available in the store created from felt. It's AMAZING! We watched a video all about her. 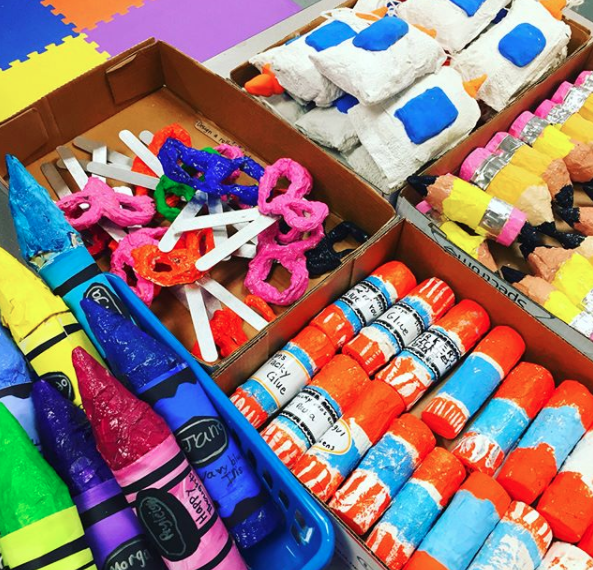 I told the kids that we'd be creating our own Art Supply Store for the art show. They are super stoked. 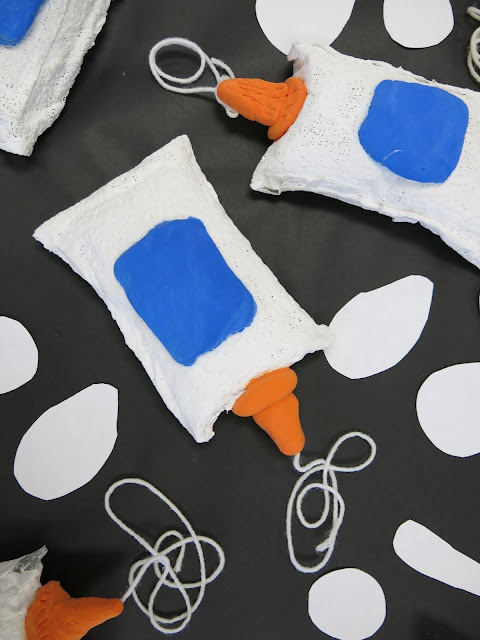 From there, each kid got a TP tube, a piece of tagboard and a couple pieces of masking tape. After tracing a template for the cone of the pencil, the kids cut it out and rolled the cone. That proved to be the part that was the most difficult. When I found a couple kids who could roll cones, I put them on cone-patrol. After the cones were rolled and secured with tape, they were taped to the top of the tube. 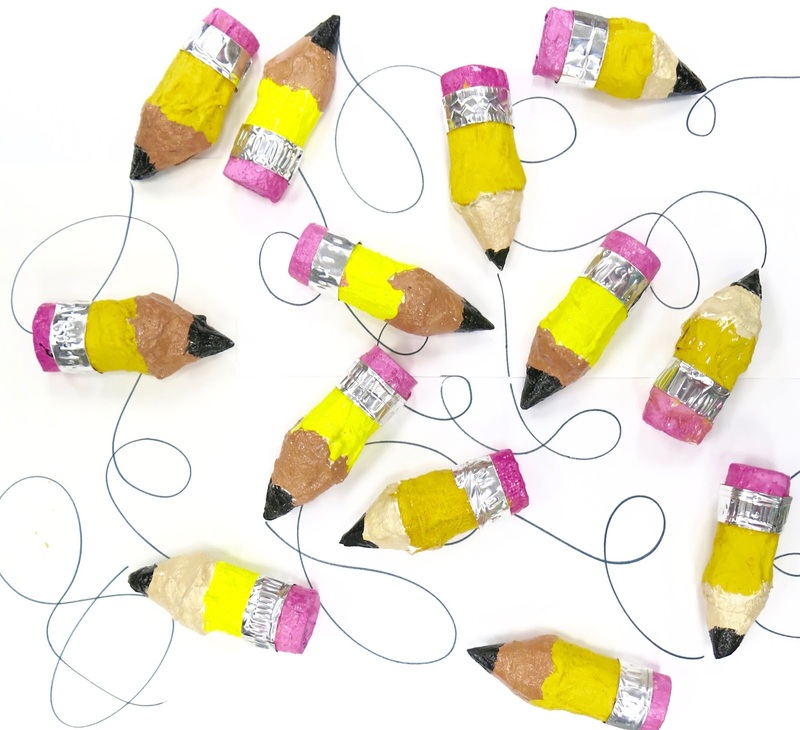 Once the armature was complete, the kids were given about 5-6 pieces of plaster to completely cover their pencils. I really like Rigid Wrap. I did emphasize not adding too much water so the tube would not collapse under the weight of the water. 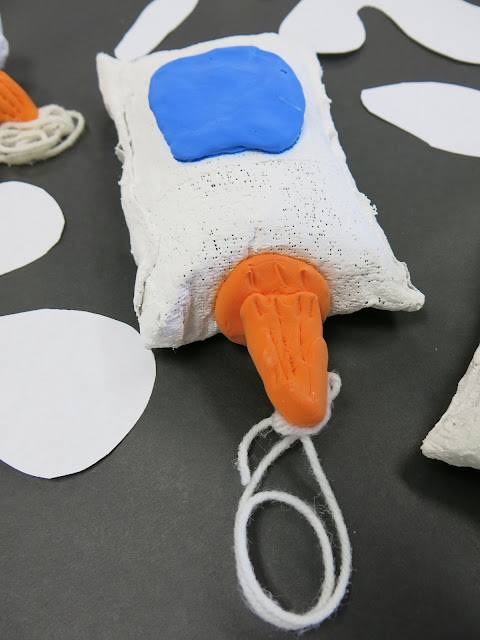 Also, if the plaster gets twisted or "messed up", according to the kids, they have to unravel and smooth it out. The plaster wrap is not cheap so I really stress using only 5-6 pieces and not wasting any. Then we set these on styrofoam plates with our names on and allow to dry. If plaster wrap is not available, you could always use papier mache. 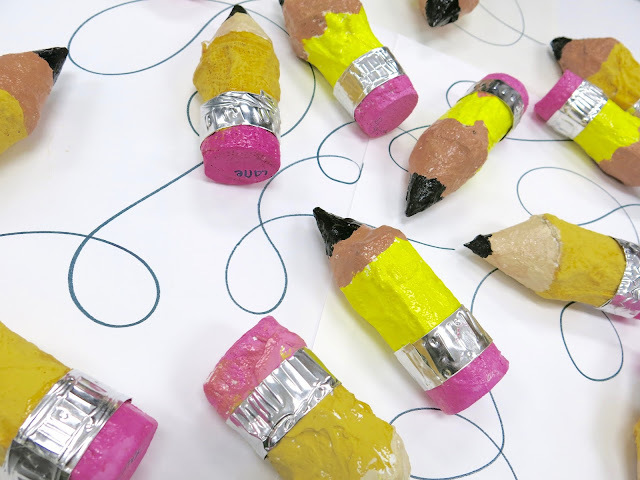 We did that when we created these pencils and crayons a couple of years ago! 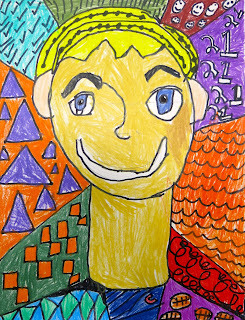 Day Two: The following art class, we watched this video that the kids LOVED. Learning how a pencil was made really struck a cord with them. From there, we painted our pencils using yellow, pink, light brown and black. 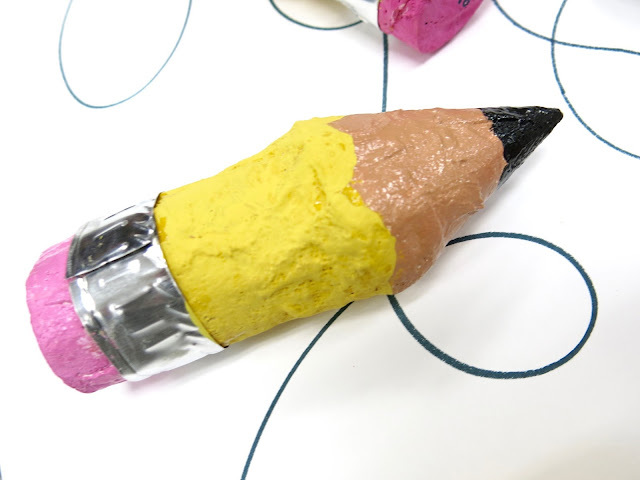 Once they were finished painting the pencil, they set it aside to dry and began working on the ferrule. The ferrule was created with metal tooling. I cut the tooling down to 1" X 7". The kids created their design and I hot glued it to the pencil. The kids were thrilled how cute, small and realistic their wee pencils looked! Now they are all about creating more art supply sculptures. Hey, kids! I'm just back from a FABULOUS conference in Texas that was seriously a whirlwind of fun. 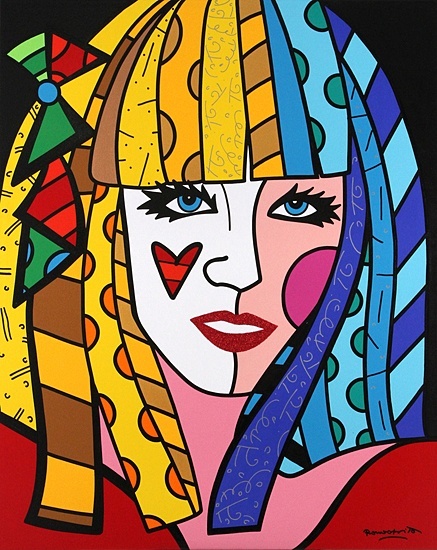 I'll be certain to share that experience with you soon but before I do, I thought I'd let you in on how that Romero Britto-inspired selfie project went down. In a word(s): colorfully amazing! I've been sharing with you a ton of self portrait projects of late as that's what I'm sending away to be framed for our Artome art show. 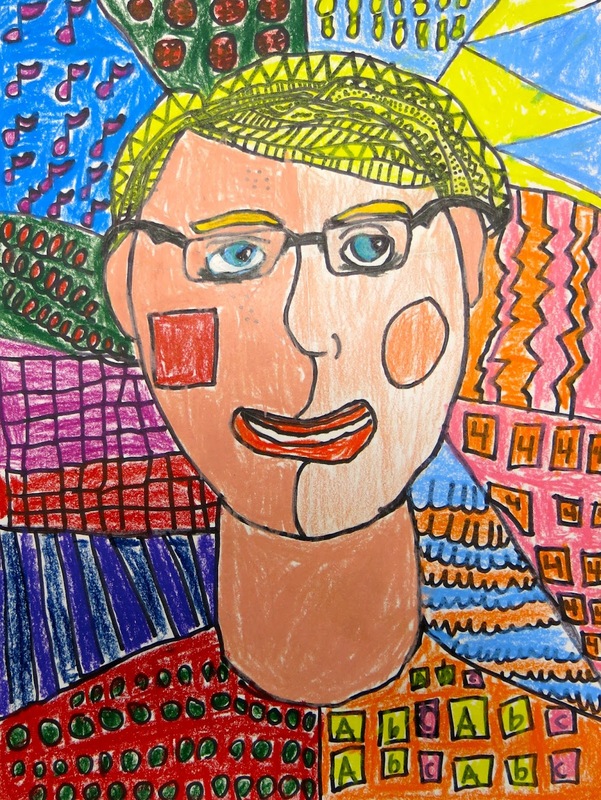 In case you missed, check out the Royal First Grade Self-Portraits, Second Grade Super Hero Selfies and the Third Grader's Sandra Silbertzweig Portraits. By the way, I update my videos multiple times weekly...if you wanna stay up to date, subscribe here. 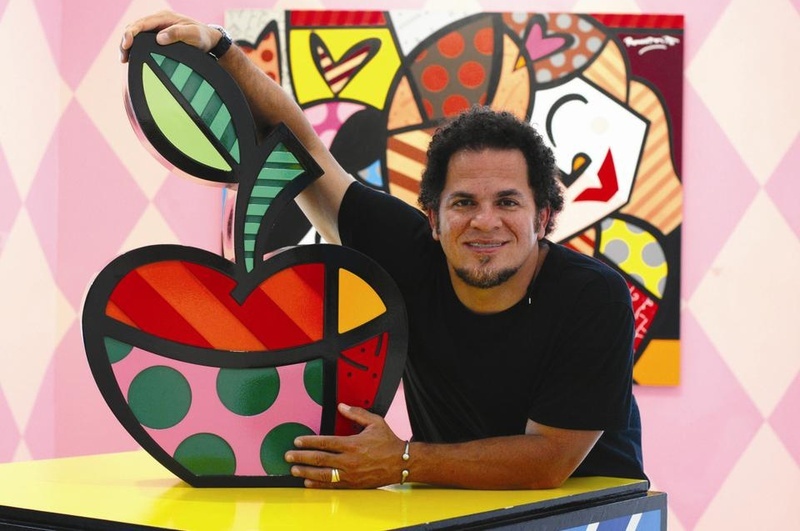 The video provides a quick introduction to Britto and his work, just enough to give them a taste for how colorful and pattern-y his work is. 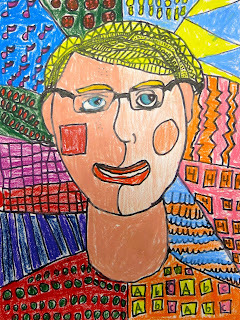 The kids really respond well to learning about contemporary artists and pop art seems to be their fave. By the third day, we'd watched all of the video and knew what we had to do to complete our masterpiece. I really thought this would be a two-day project...but with all of the details the kids created, it lasted a pinch longer. Sorry, not sure when, but I know they are in this clip somewhere! The kids and I both were really pleased with their hard work. So often, older kids struggle with self-portraits as they want them to look "just right". 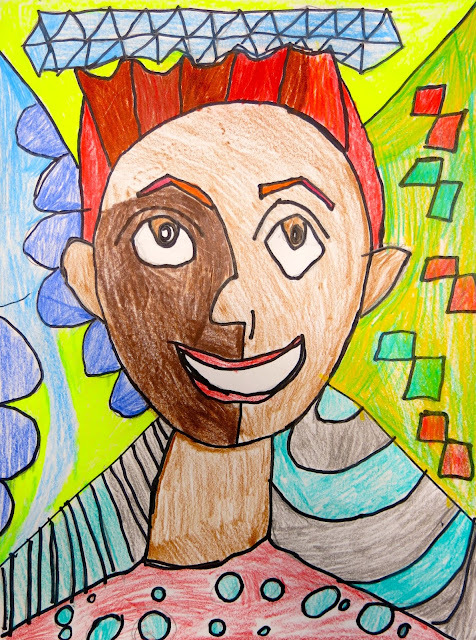 Doing a self-portrait in a guided drawing format really relieved stress and insured that all selfies looked fabulous. You know that the 10 year old crowd can sometimes be tough to please...but this one was a crowd-pleaser. Even my students who sometimes struggle with fine motor skills or sticking with projects for long periods of time shined in this lesson. You know they feel good about themselves with the "too cool for school" fourthies give you hugs at the end of art class. My favorite comment: I never knew I could draw like this! I'm shipping all of these out to Artome tomorrow and our art show is at the start of December. I'll be certain to let you know how that goes. This will be our first Artome show...I'm really excited! Y'all know we do a HUGE end of the year art show where everything that every kid has made is hung up. I'm super stoked that for this show, I don't have to hang a thing! I hope y'all have a fabulous week leading up to Turkey Day! I'll be in and out on this here blog with lots to share...so, during your break from stuffing runs, be sure to drop on by. 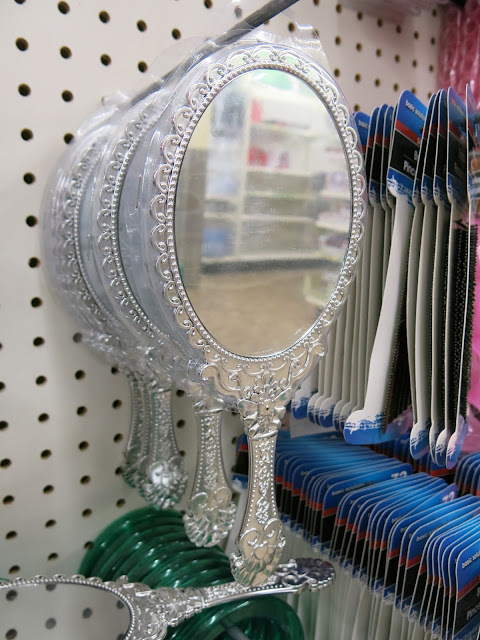 I know most of you art teacherin' types are familiar with The Dollar Tree and all of it's amazingness but I hardly ever venture inside. Prolly because I don't trust those places that refer to themselves as "dollar"-y when they actually mean dollar$$ (yes, I'm talking about YOU, Target "Dollar" Spot. Smh.) Then the other day, on a whim, I spotted something shiny in the window and tiptoed inside. Two giant bags of dollar-y goodness later, I was CONVINCED that this place was perf and I just had to share my excitement with y'all. So, here's what I picked up for my art room, why and how I plan to put it to use in some crazy creative art making! Now, like I said, I didn't buy EVERYTHING...but I got really close. Below are somethings that I left behind but I do believe would be useful in any art room. This kind of chalk is pretty useless for making art inside...but it would be great for the outdoors (hence the name "sidewalk" chalk). I thought it was a pretty solid amount of chalk for the price. 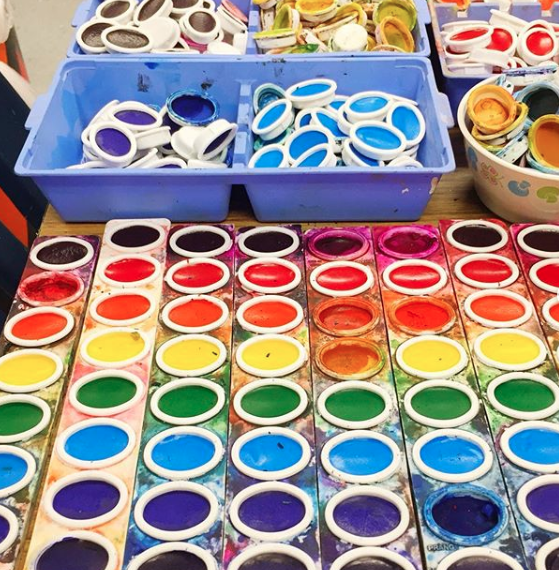 If it's one thing that no art teacher can ever have enough of, it's bowls, trays, plates, bins, you get the idea. 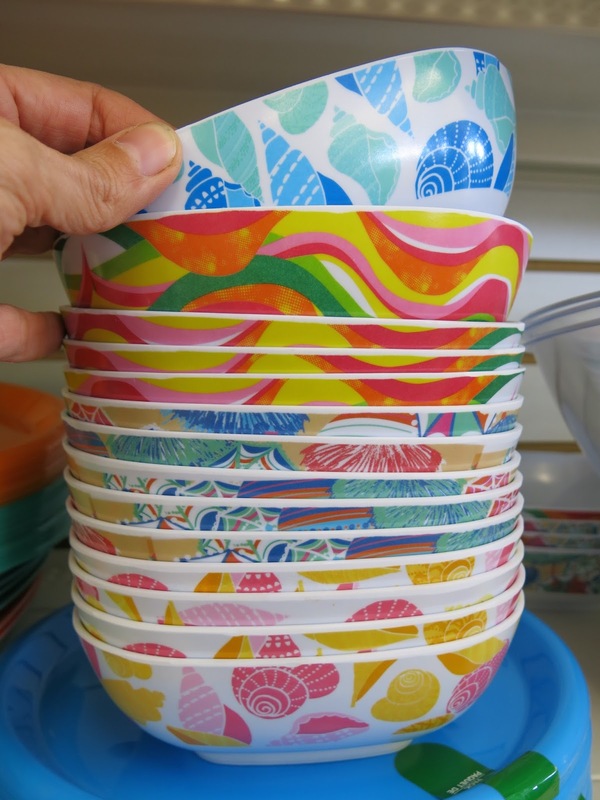 I loved the sweet patterns on these hard plastic bowls. Okay, help me out here. 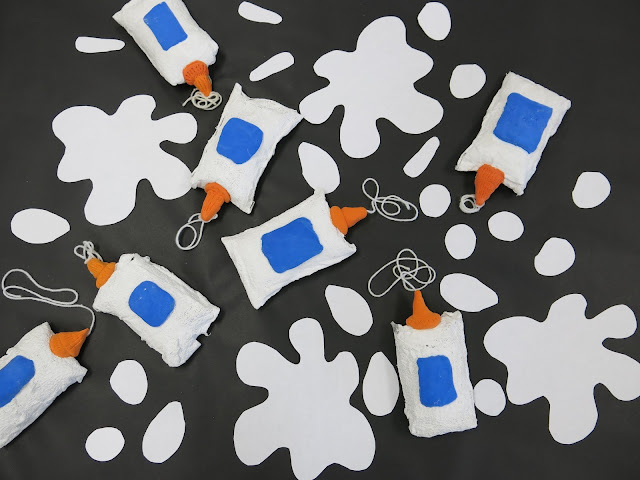 I need these in my art room! I mean, the architectural history in these sand castle building thingies is just too much. I left them behind but I do love them so. Need a cheap still life? How about a Frida Kahlo crown? The Dollah got you covered. 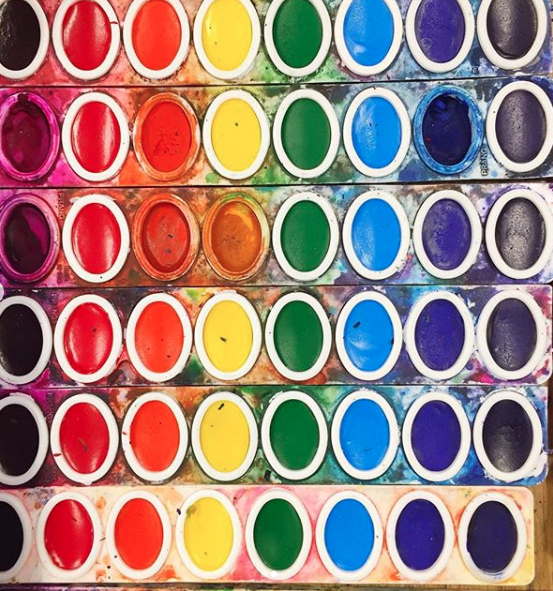 For those of you that color coordinate your art room, the possibilities were endless. Totally digging the table clothes. 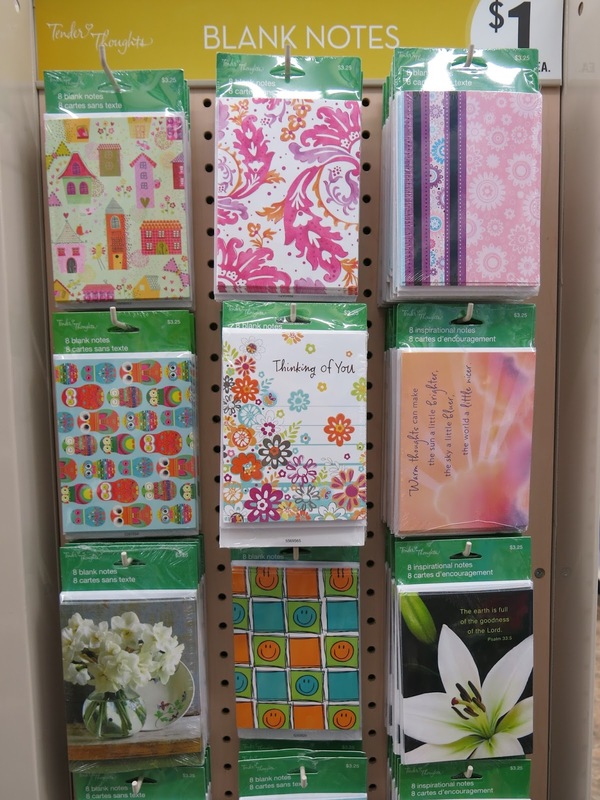 I have a stash of thank you, birthday and blank cards at school for when I need them. I hate putting together puzzles. I'd much rather use the pieces for collage projects or print making! 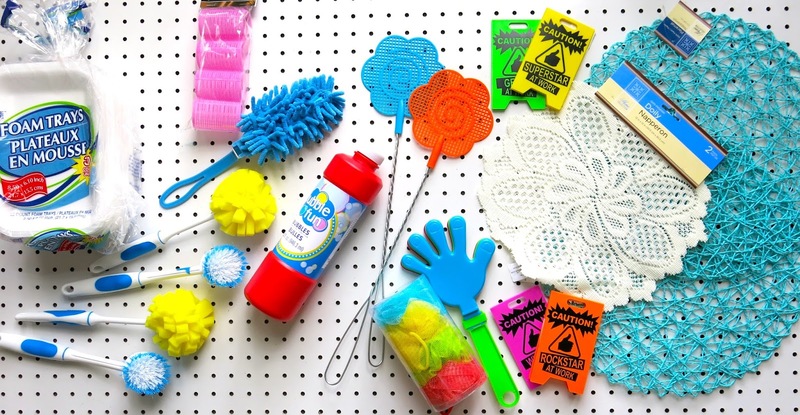 What a fun assortment for on the cheap. The assortment wasn't huge but what they did have was good: U.S. map, behavior charts, die cut letters and those things I scooped up. In my art room, I have a little light that I turn on when it's the kid's turn to chat. Meaning, when I'm giving directions, I don't want to constantly see hands up and be fielding questions. It's disruptive and time consuming. When the light is off, the kids know it's my turn to chat. When it's on, they can ask questions. An alternative to this is an Open/Closed sign. A fellow art teacher told me about it years ago. It's the same concept: Open means they can chat and ask questions; Closed means it's a listening time. How fun would these mirrors be for self portraits? I don't know if the dudes would dig them but my girls would feel like Cinderella. 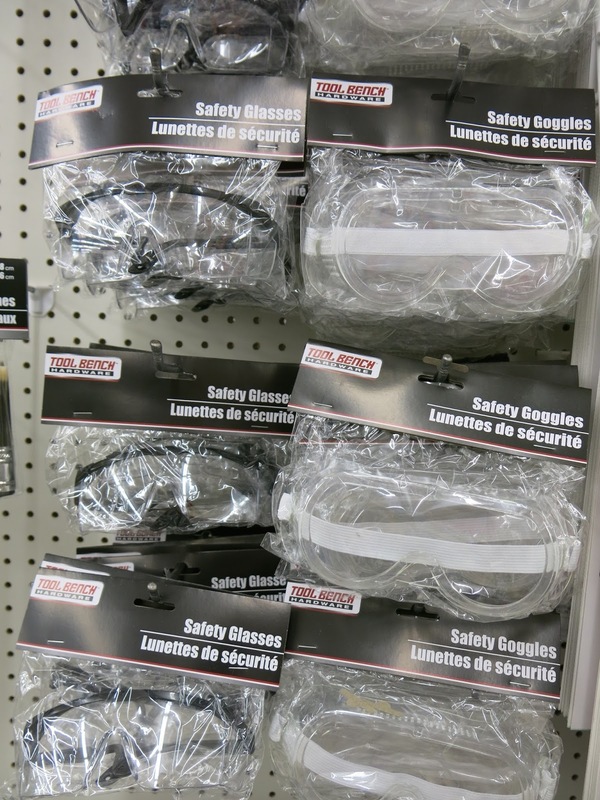 Safety googles for when things get a bit STEAM-y in your art room. I was JUST trying to find these the other day to label somethings and none of my office supply stores had them. Now I know. Totally digging those flowery trays. Think of all the art supplies those could hold per table! I mean, really. There is no reason I shouldn't be able to get organized. The Dollah was reminding me of this on every isle. 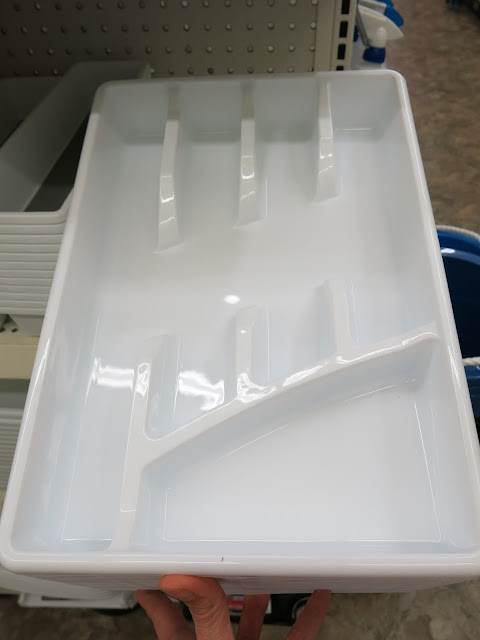 If you have sinks, you need these. I've twice had sinks get backed up because sweet, innocent children (ahem) drop paint brushes down the drain. These would be perfect screens for paper making! We use these trays in my room for papier mache and plaster projects. They are also great if you want to do paper marbling. 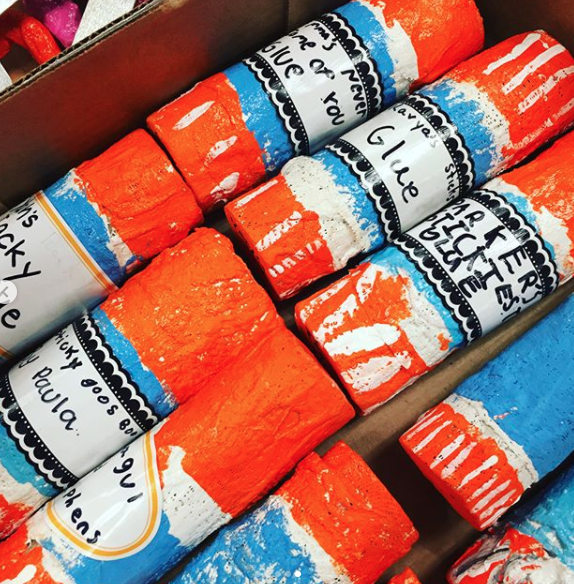 I send my students clay projects home wrapped in newspaper and stuffed in a lunch bag. These are so much cheaper than the ones I pick up at the grocery! Also, foil is wonderful for the leaf relief project you can find on the right hand side of this blog. 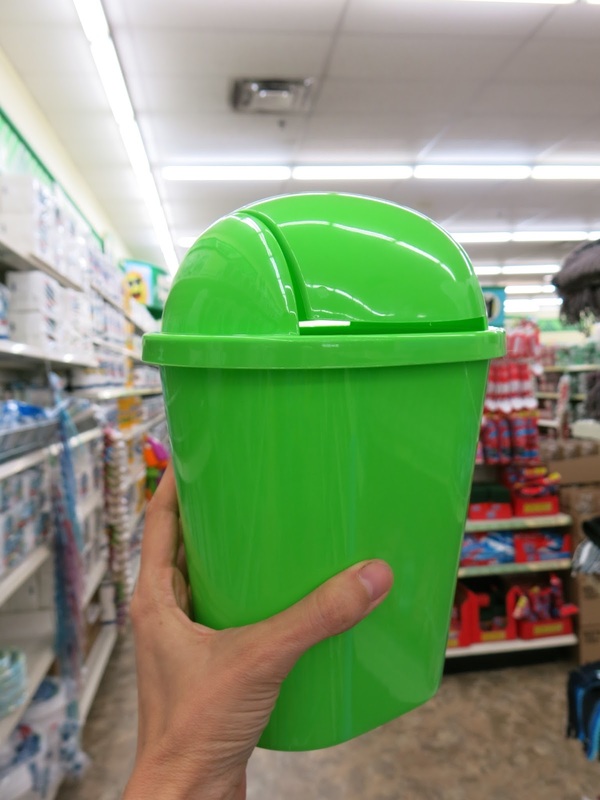 All of my tables have table top trashcans. I totes would have picked these up if I didn't have some 'cans already. I have a couple of these in my art room that get used plenty. Wanna organize those paint brushes? 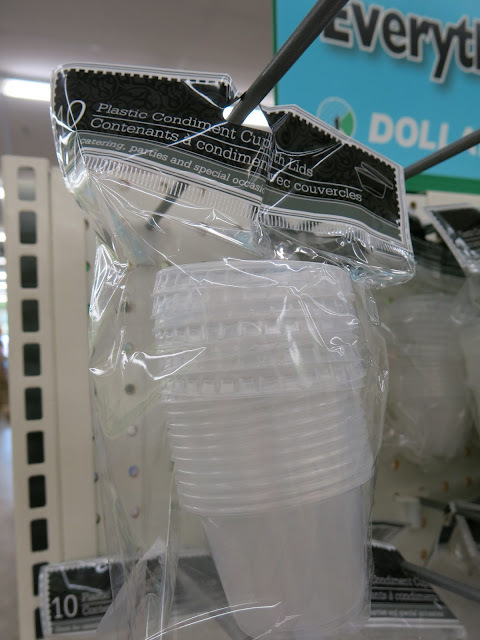 Resealable condiment cups are my jam. 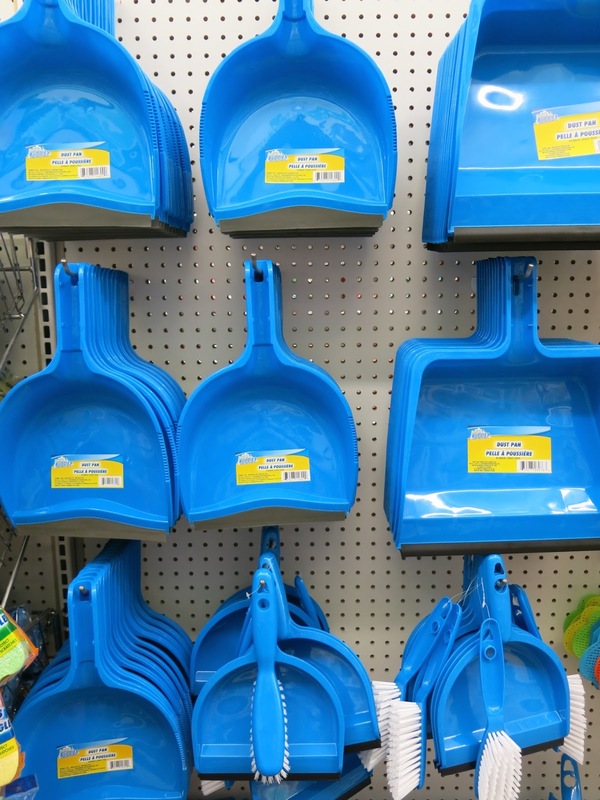 These are great for paint, glue, you name it! So, what did I forget? I'm dying for a reason to go back!